A few miles off the east coast of Northumbria is the Holy Island of Lindisfarne. It is reached from a road causeway, submerged at high tide. There is also a pilgrims’ way over the treacherous and shifting sands, whereby brave souls are able to walk (even barefoot) across from the mainland. The way is marked by posts at intervals and there are pole refuges in the event of walkers being caught by the waters unaware. Those venturing would be well advised to seek informed opinion as to the wisdom of such a trek. The island is sparsely inhabited, though with a castle, a church, the ruins of a priory and other religious and secular buildings. It is to this island that cAD635 St Aidan came from Iona at the invitation of King Oswald in order to convert the pagan Anglo-Saxons of that region. Later the revered St Cuthbert continued the missionary work. He died in AD687. A successor was a monk named Eadfrith, later Bishop of Lindisfarne (in AD698) who died in AD721. 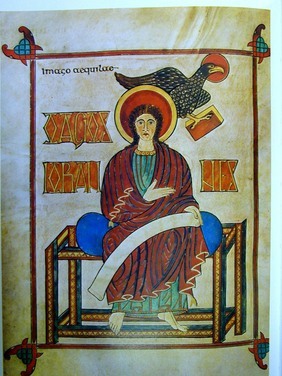 Eadfrith is credited for being the author of an Anglo-Saxon masterpiece of calligraphy and illumination, entitled ‘The Lindisfarne Gospels’. It is probable that all the Insular Script, which resembles Uncials and Half Uncials, was the entire work of Eadfrith. The beauty and unity of the script would have taken him years to execute. The Gospels can now be seen at the British Library and there are excellent facsimiles elsewhere. The Book is liberally illustrated and patterned. Written on Vellum, the text is in a deep brownish-black. Ultra violet light reveals traces of a kind of pencil sketching as preparatory work. Colours were received both from local and foreign sources. The decoration shows similarity with Hibernian, German and Viking origins - clearly eclectic in the scriptorium at Lindisfarne. Indeed, the Gospel title pages are, in construction, remarkably parallel with Runic Scripts of the Norsemen. There is no reason to doubt the authenticity of a Colophon inserted by the priest Aldred. He averred that the calligraphy was the work of Eadfrith in honour of St Cuthbert, with Ethelwald illuminating and an Anchorite named Billfrith doing the binding. Aldred inserted in a different script an early English translation between the lines of Latin. The cover was lost during a Viking invasion and a replacement made in 1852. The Book is a gem among early religious writings and is a wonderful example of Anglo-Saxon high art.